I've been juicing since birth. Well my mother has. I was an underweight, sickly preemie so mom started me on natural juices at a very young age. This was long before juicers like, the Juiceman or Montel's Health Master. In fact, I remember clearly mom straining carrot juice through a dishrag. Ma, I wasn't even 5, it looked like a dishrag to me. I also used to make you onion juice to clear out the mucous. Do you remember that? It's a vivid recurring nightmare along with you turning me orange, but let's not discourage or scare the people. Agreed, because these days there are lots of juice "recipes" that are yummy and healthy. These drinks will provide us with many of the nutrients that are missing from our daily diets. Dr. Oz recommends juicing green vegetables and we've been told it will add years to our lives. The books Green For Life and the Wheatgrass Book give testimonials from people being healed of cancer and other ailments as a result of juicing regularly. The very first thing you have to do is pick a juicer and do not spend a lot of money on it until you find one that fits your needs. One tip I can give you is to choose a juicer that has a wide mouth. Through out the years, we've owned the Omega 1000, Acme 6001 and The Juiceman. These juicers have served us well. But wait Ma, the very first thing to do is to educate yourself. We're not going to bore you here with all the details, but choose your juicer based on the types of fruits and veggies you intend to juice. Until recently, we never juiced leafy greens. If you intend to juice greens, you need a masticating juicer. It will still handle hard vegetables like carrots, but its process is sensitive enough to handle leafy greens as well. READ UP ON JUICING. Now for our favorite part - THE RECIPES. I hope you don't plan on including the onion juice. If I had given you some onion juice a few weeks ago young lady, you would not have been out for a week with bronchitis last month. I'd rather have the bronchitis. Seriously though, Mom and I were inspired by a friend to begin juicing on a daily basis and we've been doing it since last April. The health benefits have been substantial. Our level of energy has increased, my skin has cleared and I'm looking more youthful. I avoided a surgery because after a few months of juicing my symptoms went away and the doctor told me to just continue doing what I've been doing. And by the way folks, we welcome you to send in questions on juicing, but the best thing to do is read up and then start experimenting. And just a tip, carrot juice is a great base for any juice cocktail. About 3 carrots will do. To sweeten any recipe just add a couple of apples. And for some kick, add a little ginger. And consider organic produce it's the healthiest choice. Didn't we say it was time for the recipes. Let's stop blabbing and give them some classics. Carrots are great for everything and beets are blood builders. I cured my anemia in a matter of weeks and got limitless energy drinking this one. Mom and I throw in a little knob of ginger for a kick. 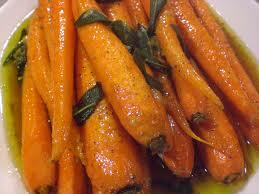 Thoroughly wash and rinse carrots under cool running tap water, if needed, scrub with a vegetable brush. Wash and rinse your apples, and then quarter them. Thoroughly wash and rinse the beet, scrub with a vegetable brush until all dirt and grit is removed. Cut into quarters. Wash and rinse the ginger. Place a tall glass under the juice spout, and slowly begin feeding in all of your ingredients. Depending on how moist your vegetables are, you might want to adjust your proportions accordingly. Once your juice is finished, give it a quick brisk stir to make sure you have an even blend. Remember juices should be consumed immediately, as they don't hold their nutritional value for very long. However, if you opt for Montel's Health Master, your juice has a longer shelf life. It's really a matter of preference. We are use to a juicer that extracts the juice and most of the pulp goes into the garbage. The Health Master retains all of the pulp thereby, producing a healthier drink. Forget your chamomile tea, celery will relax you, it's loaded with potassium, making it a good blood pressure regulator. Mom had a potassium deficiency and corrected it in 3 weeks with this drink. And we all know an apple a day keeps the doctor away. Remember the reason we are juicing is for health, so you want to be sure not to ruin your efforts. You really should try to buy organic produce. We take a trip to the local farmer's market once a week. When you get your beets and carrots keep the green tops on, because they provide a whole new level of nutrition. 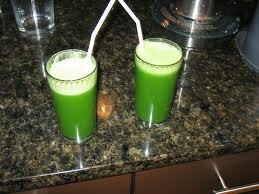 The basic rule for celery apple juice is 3 part apple juice to 1 part celery juice. Wash and quarter apple, make sure you remove all the seeds from the apples to prevent the bitterness they create in the juice. Rinse and scrub celery with a vegetable brush. Run apples and celery through the juicer. Stir well to combine and spoon off any foam that may be on the top. Special Note: The celery adds a tang to the apple juice that is absolutely delightful. The highly alkaline celery will neutralize acids in your stomach that may be causing discomfort. It helps maintain your blood in its delicate alkaline balance. When you perspire heavily during a workout or feel wilted because of the heat, this juice will put back the sodium you have lost. We make this one almost every morning. Remember, when experimenting with adding greens, you have to play and find the right formula for you. These juices can taste good. Angelique makes all the green drinks taste good because she uses at least 3 big carrots and an apple and they tend to lessen the bite of the greens. Thoroughly wash and rinse all fruit and vegetables. Scrub hard vegetables/fruit with a vegetable brush if needed. Feed hard fruit and vegetables through the juicer with the leafy vegetables wrapped around them. Or feed the kale though by placing the stem in first and using the hard vegetables to help push the leaves through. A quick final note, please make sure you're fully committed to juicing before going out and spending a lot of money on a juicer. 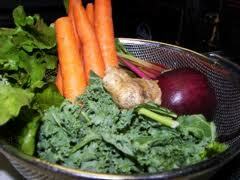 Juice chains like Robek's and Jamba Juice offer carrot, apple, beet and wheat grass juices. Small local juice bars offer an even wider array, so feel free to test things out on a glass by glass basis first. Thanks to Bev and Justin for inspiring this blog entry and to Pammie for inspiring us to juice daily. 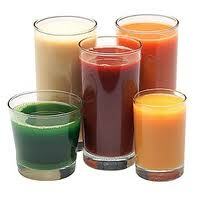 Remember juices should be consumed immediately, as they don't hold their nutritional value for very long. However, if you opt for The Health Master, your juice has a longer shelf life. It's really a matter of preference. We are use to a juicer that extracts the juice and most of the pulp goes into the garbage. The Health Master retains all of the pulp thereby, producing a healthier drink. You've heard them over and over: "Eggs are bad for your heart"; "Carbohydrates make you fat." Despite the truth, these and other food myths continue to circulate. EatingWell set out to attack 13 commonly-held food and nutrition myths to separate the science from the silliness. When I was a teenager, I steered clear of chocolate. Not because of the calories or even the fat (which was considered the ultimate evil back in the '70s). It was because I had read, somewhere, that chocolate caused acne — and the last thing I wanted was zits. Years later, I was relieved to learn that studies had unequivocally shown there was no connection between chocolate and skin problems, and that some types of chocolate, in fact, may even be good for you. So it was jarring when I recently heard a mom urge her daughter to get a vanilla ice cream cone instead of a chocolate one, saying, "Chocolate gives you acne, you know." Why do some nutrition myths die and others keep bouncing back, even in the face of what seems to be incontrovertible evidence? "Let's face it, myths and misinformation are much more seductive than the truth," says Keith-Thomas Ayoob, Ed.D., R.D., professor of pediatrics at Albert Einstein College of Medicine in New York. A balanced diet, enough sleep and regular exercise are usually the best course for fighting diseases and staying healthy, he notes, "and that just isn't as interesting to people." In reality, the most persistent nutrition myths are those that contain at least a kernel of truth — and some "myths" help us get to real dietary wisdom that actually might help our health. Here's a cold, hard, science-based look at some of the most oft-repeated ones and what really is the truth behind them. 1. "Eggs are bad for your heart." Eggs do contain a substantial amount of cholesterol in their yolks — about 211 milligrams (mg) per large egg. And yes, cholesterol is the fatty stuff in our blood that contributes to clogged arteries and heart attacks. But labeling eggs as "bad for your heart" is connecting the wrong dots, experts say. "Epidemiologic studies show that most healthy people can eat an egg a day without problems," says Penny Kris-Etherton, Ph.D., R.D., distinguished professor of nutrition at Penn State University. 2. "High-Fructose Corn Syrup is worse for you than sugar." Though consumers who fill their shopping carts with products labeled "No HFCS" might feel otherwise, the idea that high-fructose corn syrup is any more harmful to your health than sugar is "one of those urban myths that sounds right but is basically wrong," according to the Center for Science in the Public Interest, a Washington, D.C.-based nutrition and health advocacy group. High-fructose corn syrup was created to mimic sucrose (table sugar), so its composition is almost identical to sucrose's. Calorie-wise, it's a dead ringer for sucrose. And in studies that compare the effects of HFCS with other sweeteners, HFCS and sucrose have very similar effects on blood levels of insulin, glucose, triglycerides, and satiety hormones. In short, it seems to be no worse — but also no better — than sucrose, or table sugar. "The debate about HFCS and sucrose [table sugar] is taking the focus off the more important question," says Kimber Stanhope, Ph.D., R.D., a researcher at the University of California, Davis, who has studied the sweetener extensively. "What we should be asking is 'What are the effects of all sugars (HFCS and sucrose) in the diet?'" 3. "Carbohydrates make you fat." Contrary to the theories of the low-carb/no carb manifesto, Dr. Atkins' Diet Revolution, first published in 1972 (and the similar books that followed), there's nothing inherently fattening about carbohydrates, says Jean Harvey-Berino, Ph.D., R.D., chair of the department of nutrition and food sciences at the University of Vermont and co-author of The EatingWell Diet (Countryman, 2007). "It's eating too many calories, period, that makes you fat." 4. "A raw-food diet provides enzymes that are essential to healthy digestion." "Raw foods are unprocessed so nothing's taken away; you don't get the nutrient losses that come with cooking,” says Brenda Davis, R.D., co-author of Becoming Raw: The Essential Guide to Raw Vegan Diets (Book Publishing, 2010). But the claim by some raw-food advocates that eating raw boosts digestion by preserving "vital" plant enzymes, Davis explains, just doesn't hold water. "Those enzymes are made for the survival of plants; for human health, they are not essential." 5. 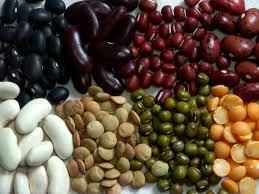 "Your body can't use the protein from beans unless you eat them with rice." Proteins — which our bodies need to make everything from new muscle to hormones — are made up of different combinations of 20 amino acids. Thing is, our bodies can make only 11 of these amino acids; we must get the other nine from food. Animal-based protein-rich foods like eggs and meat provide all nine of these "essential" amino acids, but nearly all plant foods are low in at least one. Experts used to say that to get what your body needs to make proteins, you needed to pair plant-based foods with complementary sets of amino acids —like rice and beans. Now they know that you don't have to eat those foods at the same meal. "If you get a variety of foods throughout the day, they all go into the 'basket' of amino acids that are available for the body to use," says Winston J. Craig, Ph.D., R.D., nutrition department chair at Andrews University in Berrien Springs, Michigan. 6. "Calories eaten at night are more fattening than those eaten early in the day." Dr. John Foreyt: "Calories are calories are calories, and it doesn't matter what time you eat them. What matters are the total calories you take in." John Foreyt, Ph.D., is the director of the Behavioral Medicine Research Center at Baylor College of Medicine. 7. "I have a weight problem because I eat foods like wheat or dairy that my body can't process." This theory is, in fact, "illogical," says Marc Riedl, M.D., assistant professor of clinical immunology and allergy at UCLA. The inability to "process" foods, he notes, "would mean the foods are not metabolized and calories would not be absorbed." This would lead to weight loss, not gain, he notes. "This is an example of how the term 'food allergy' has become misused and distorted to be associated with anything unpleasant surrounding eating," says Riedl. "There is no scientific evidence that a food allergy causes weight gain." Of course, cutting out whole categories of foods will probably help you lose weight, simply because it takes so many choices off the table. 8. "Radiation from microwaves creates dangerous compounds in your food." "Radiation" might connote images of nuclear plants, but it simply refers to energy that travels in waves and spreads out as it goes. Microwaves, radio waves, and the energy waves that we perceive as visual light all are forms of radiation. So, too, are X-rays and gamma rays — which do pose health concerns. But the microwaves used to cook foods are many, many times weaker than X-rays and gamma rays, says Robert Brackett, Ph.D., director of the National Center for Food Safety and Technology at the Illinois Institute of Technology. And the types of changes that occur in microwaved food as it cooks are "from heat generated inside the food, not the microwaves themselves," says Brackett. "Microwave cooking is really no different from any other cooking method that applies heat to food." That said, microwaving in some plastics may leach compounds into your food, so take care to use only microwave-safe containers. This is misguided thinking, says Carol Byrd-Bredbenner, Ph.D., R.D., professor of nutrition at Rutgers University in New Brunswick, New Jersey. Whether you're using a microwave, a charcoal grill, or a solar-heated stove, "it's the heat and the amount of time you're cooking that affect nutrient losses, not the cooking method," she says. "The longer and hotter you cook a food, the more you'll lose certain heat- and water-sensitive nutrients, especially vitamin C and thiamin [a B vitamin]." Because microwave cooking often cooks foods more quickly, it can actually help to minimize nutrient losses. 10. "You crave certain foods because you're deficient in one of the nutrients they provide." Nope — unless you're a deer or moose. (In the spring, those animals are attracted to "salt licks" — mineral deposits that supply nutrients they need.) Human food cravings tend to be more about satisfying emotional needs, says Marcia Pelchat, Ph.D., a researcher at the Monell Chemical Senses Center in Philadelphia. "Cravings tend to occur when your diet is restricted or boring, or when you know that you can't have something," says Pelchat. "If it's forbidden, you usually want it more." Our metabolisms rev up slightly each time we eat, as our bodies process what we've consumed. So by having many mini meals instead of fewer, larger ones, we shift our metabolism into a higher gear more often — and burn a few more calories. But "the calorie difference is so small it doesn't add up to a hill of beans," says John Foreyt, Ph.D., director of the Behavioral Medicine Research Center at Baylor College of Medicine in Houston. That said, snacking between meals may help some dieters by keeping them from getting overly hungry and eating too many calories when they finally sit down to dinner. But probably for just as many others, "each meal is an opportunity to lose control," says Foreyt. Bottom line: Choose the eating pattern that works best for you. 12. "It's important to fast periodically, to cleanse toxins from your body." The truth: Your body has its own elegantly designed system for removing toxins — namely, the liver, kidneys, and spleen. There isn't any evidence that not eating — or consuming only juice — for any period of time makes them do this job any better. Source: Keith-Thomas Ayoob, Ed.D., R.D., of Albert Einstein College of Medicine. 13. "Anyone can benefit from a gluten-free diet: it can give you more energy and even treat autism." With more and more gluten-free products cropping up in supermarkets, it's easy to think their benefits might stretch beyond the audience for whom they're intended: people with celiac disease and gluten intolerance. Celiac disease is an autoimmune condition in which the body can't digest gluten, a protein found in wheat, rye, and barley; it's marked by damage to the small intestine that leads to deficiencies because nutrients can't be absorbed. A blood test is used to diagnose celiac disease. Gluten intolerance, on the other hand, may be diagnosed when abdominal distress, and sometimes fatigue, regularly occurs after consuming gluten — and celiac disease has been ruled out. If you don't have a medical reason for following a gluten-free diet, "there's probably no benefit," says Tricia Thompson, R.D., a Massachusetts-based dietitian and founder of http://www.glutenfreedietitian.com. Alberto is a single guy who contacted us because he wants to impress his girlfriend with a Filet Mignon Valentine's Dinner. Alberto claims that he can't even boil water so mom came up with this delectable meal which is relatively easy to prepare. Bon appetit to Alberto and everyone else who is preparing that special Valentine's Day Meal. Happy Valentine's Day to all. Rinse spinach and spin in a salad spinner or drain in a colander then blot with paper towels to remove excess water. Whisk together dressing and set aside. 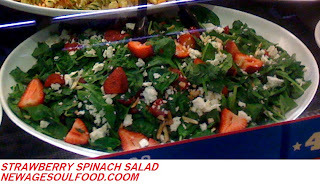 Toss spinach with enough dressing to lightly coat. Add the strawberries and almonds and toss again. Place on platter and top with feta cheese and chives. Wash steaks and place them in a pint size zip lock bag. Pour in the red wine vinegar and let steaks marinade overnight in the vinegar, turn bag a few times to make sure steaks are well covered. Set steaks on counter to gradually warm to room temp while preparing other ingredients. If you have, use a coffee grinder to crack the peppercorns, or place peppercorns in a plastic bag and use the back of a heavy pan to crack them. Mix together the coarsely cracked peppercorns, granulated garlic and onion. Remove steaks from plastic bag and blot off the excess vinegar with a paper towel. Roll steaks in the peppercorn mixture and mash mixture into steaks until all sides are coated. Heat a heavy skillet over high heat, add steaks to hot dry skillet and cook according to schedule listed below. Transfer to platter. Let rest for 10 minutes before serving. Juices will redistribute and steak will continue cooking during this time. 24 hours prior to cooking, prep potatoes by scrubbing with a vegetable brush to remove dirt. If potatoes are larger than 1 inch in length, cut them in half. Cover potatoes with cold water squeeze in the juice of ½ lemon then add lemon rind to water. Refrigerate and let potatoes soak overnight. Remove potatoes from refrigerator and let drain in a colander. Blot potatoes with a paper towel to remove excess liquid then place them in a large bowl. Add the rosemary and mix thoroughly by hand. Add chili peppers, salt, onion and garlic powder and mix thoroughly. Add olive oil and minced garlic and mix until every potato is well coated. Place potatoes on the sprayed baking sheet and bake in a preheated oven 30 minutes or until they are golden brown and tender. Toss carrots in a bowl with the olive oil, salt, pepper and dill. Transfer to a baking sheet in 1 layer and roast in the oven for 20 minutes or until browned and slightly tender. Heat oil in heavy large pot over medium heat, add onions and cook until soft and beginning to brown, stirring often, about 5 minutes. Add garlic, saute 1 minute. Sprinkle in chili powder and coriander, saute a few seconds. Stir in tomatoes with juice, beans, chipotles, oregano, granulated garlic and onions. Add 10 cups water. Bring to a boil, reduce heat to medium low and simmer uncovered 1 hour. Continue cooking until beans are tender, stirring occasionally. Total cooking time should take approximately 2 hour. Add squash, Tvp and remaining salt to chili. Simmer uncovered over medium-low heat until squash is tender, about 30 minutes. So the Bon Appetit magazine for February came in. I guess I was bored and decided to flip through it only to find several divine recipes that I wanted to try. You have to understand something about Ange, it takes her forever to actually get around to trying new recipes. Unlike me, I see something and 3 days later I'm in the kitchen testing it. Meaning there's never any room in the kitchen for me. When you're out of town, I try all kinds of new stuff, Ma. So now it's my fault, huh? Anyway, Ange and I had a nice day in the kitchen. For once, I let her do all of the cooking. I just gave her motherly and chefly advice. This is a really easy recipe for you non-cookers. We actually taped it, but mom won't let me post the video because the kitchen was junkie. Can I at least post the demonstration on how to cut a butternut squash? Nope. But good job picking this recipe, it was delicious. We've adjusted it to add our own flavor and you meat eaters can always add ground turkey. And you can make this recipe really simple by getting canned beans, canned tomatoes and pre-packaged butternut squash. That will cut your prep time and cooking time down considerably. If you want the original recipe, just go to Bon Appétit February 2011. But here's the New Age Soul food version. Add squash, vegetable crumbles and remaining salt to chili. Simmer uncovered over medium-low heat until squash is tender, about 30 minutes. 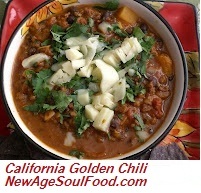 Note: To make a meat chili, add ½ - 1 pound of ground turkey (sautéed and seasoned with salt and pepper) instead of the vegetable crumbles.